Automakers fighting back against President Donald Trump’s import tariffs, slumping March new car sales, we get some insight into Nissan under Carlos Ghosn and so much more for The Morning Shift of Friday, March 29, 2019. Groups representing many arms of the industry — automakers, dealers, parts suppliers and aftermarket companies alike — are in lockstep in their opposition of new levies being considered by the White House, a rarity for an industry that often disagrees on major policies. According to the article, Trump will look at the Commerce Department’s recommendations on the matter, and while he technically has until May 18 to respond a decision may take longer. So who knows how or when this whole Car Import Tariff thing will shake out. Each month, industry analysts report automobile sales figures, and as March comes to a close, it looks like numbers might be down for the third straight month, Automotive News reports. The news site says four forecasters have predicted drops between 1.5 and 7 percent compared with March of last year. Analysts say the decline stems from an unsettled regulatory environment, as well as concerns that vehicles are becoming less affordable for consumers. Cox said volatility in the stock market, uncertainty around President Donald Trump’s trade policies and concerns about the potential for an economic slowdown might be scaring off some would-be buyers. It noted that continuing new-vehicle price increases coupled with tepid incentives also could be hampering sales. In other words, smaller refunds may dampen new car purchases. Gosh, have I heard lots of complaints about this year’s tax returns. By now, everyone knows about Carlos Ghosn, the ousted former Nissan-Renault boss facing trial in Japan over alleged financial misconduct. The environment was ripe for back-stabbing — and now Mr. Ghosn has said that is exactly what happened to him. A key part of the article is the description of tensions between Nissan and Renault—two companies that some thought at one time had been brought together to form a smooth-sailing corporate partnership. It’s complicated further by the French government’s partial ownership of Renault. But Ghosn’s “strong” leadership was key to holding the Renault-Nissan partnership together, and now the Times refers to that partnership as a “fractured alliance” that both companies are actively trying to bring back from the brink. And yet now merger talks are back, and maybe with Fiat Chrysler at the table too. Color us skeptical. Lyft filed for an Initial Public Offering early this month, and on Friday, it plans to sell for $72 a share, bringing the company’s valuation to about $24 billion. With the company losing a distressing amount of money, investors have to hope revenue growth either will become sustainable with less marketing spending or grow enough to offset the hemorrhaging. Neither seems likely in the near-term. More on this from us later today. ZF Friedrichshafen—the German auto parts supplier that employs 146,000 people around the globe, and makes various driveline and chassis parts including transmissions not just for cars, but also for boats, commercial vehicles, motorcycles, helicopters, and even wind turbines—has just announced its recent $7 billion acquisition of Switzerland-headquarted commercial vehicle safety and connectivity company WABCO. Short for Westinghouse Air Brake Company, which was founded in 1869 in the U.S., WABCO is known for its active safety systems on commercial vehicles like automatic emergency braking, as well as for air suspension systems, and transmission automation systems. ZF says in its press release that buying WABCO would bring bring commercial braking expertise into ZF’s portfolio for the first time—a key area for ZF, as it wants to crank up its automated driving game. ZF expects that automated driving functions will primarily be implemented for commercial vehicles and in areas with low complexity and traffic (e.g. factory sites, airports, agriculture). The combination of both businesses is expected to further accelerate the development of new technologies to enable autonomous commercial vehicle functions, making ZF less dependent on the economic cycle of the passenger car industry. The planned strategic acquisition of WABCO is consistent with ZF’s goal to develop and deliver technology solutions that make cars and commercial vehicles see, think and act in order to reduce emissions and increase road safety. While ZF already has sensor systems and computing technology for its “see“ and “think” competence, together with WABCO ZF will in future be completing the portfolio for commercial vehicle technologies to offer solutions to allow vehicles to “act”. General Motors Corp. Chairman and CEO Rick Wagoner will step down immediately at the request of the White House, administration officials said Sunday. The news comes as President Obama prepares to unveil additional restructuring efforts designed to save the domestic auto industry.The officials asked not to be identified because details of the restructuring plan have not yet been made public. On Monday, Obama is to announce measures to restructure GM and Chrysler LLC in exchange for additional government loans. Neutral: Are You Onboard With Tariffs? 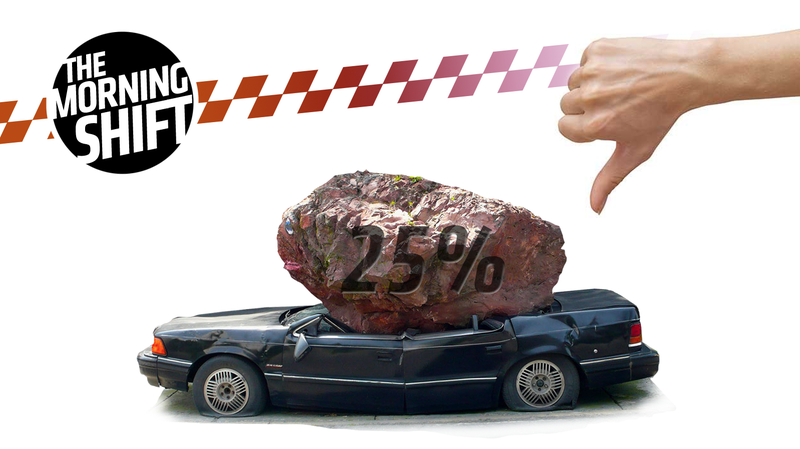 When would a car tariff make sense in your eyes? I Can&apos;t Choose Between Cargo Space And Horsepower! What Car Should I Buy?